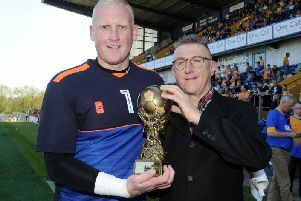 Sunday’s Kevin Bird charity match at the One Call Stadium proved a huge success with 1,462 turning out to see a Stags Legends team beat a Soap Stars/Celebrities side 7-1. Former Stags legend Bird is now suffering from dementia so the proceeds, yet to be totalled up, will be split between Once Upon a Smile and the Alzheimer’s Society charities. The celebs and ex Stags players were out in force., Mansfield, United Kingdom, 14th May 2017. Photo by Glenn Ashley. “From start to finish the day ran really well with the support of so many people. “The highlight for me was the Spitfire fly-past which was incredible. It went past four times and the game was stopped for it. The older people around us were crying. I was in awe of it and it brought tears to my eyes too. “The players came from all over the country to take part, which was fantastic, and we had two lads – William Cox and Paul Bullock – who paid £250 each to take part in the game. The Legends team stormed to victory with Richie Barker bagging a hat-trick and X-Factor and I’m a Celebrity Get me Out of Here star Jake Quickenden netting for the celebrity side. Only Dave Caldwell was a no-show for the Legends while Emmerdale star Danny Miller missed out on the game as he had to be at the BAFTA awards where his programme picked up the Best Soap BAFTA. “Danny tweeted later that he was gutted not to be able to play at Mansfield which was lovely of him,” said Walker. “Nigel Pinnock and his team of officials were just brilliant and thanks also to announcer Alan Wilson and Richard Wells of Playback Events for the music. At half-time there was a seven-a-side game between Nottinghamshire Police and Derbyshire Police with the crowd, tongue-in-cheek encouraged to boo and the players raising another £200 or so with sponsorship. Kath Graves, of the Halifax Building Society, organised the tombola and, whatever it raised, the Halifax have agreed to double it. Also, Gill Goucher, of HSBC Mansfield branch, sold raffle tickets with the bank giving them sponsorship for helping on the day. Of the three auctioned signed shorts, Carlos Tevez made £130, Nathan Arnold made £140 and N’Golo Kante, donated by the PFA’s Gordon Taylor, made £360. Walker added: “We had 90 mascots who all raised money for us and one of the boys’ mothers sent me a message saying her boy had said it had been the best day of his life which made me cry – that was so lovely. “It was also very emotional at the pre-match Sunday lunch when Kevin and his Legends team went on stage. The win for the Legends saw the annual Jamie Walker trophy return to Mansfield after the Soap Stars/Celebrities won it last time round. Club chairman John Radford, CEO Carolyn Radford, stadium director Paul Broughton and operations director Tina Broughton were all in attendance. Kevin Bird’s wife Sue, said: “It was an absolutely amazing day – it went far beyond my expectations. “We got a very good crowd and it was all a bit overwhelming to be honest. She added: “When Kevin came to Mansfield he went into lodgings with Wilf and Barbara Bingley, who were like a second mum and dad to him. However, the true horror of dementia was underlined on Tuesday. STAGS LEGENDS TEAM: Nicky Weaver, Bobby Hassell, Alistair Asher, Jamie McGuire, Simon Coleman, Adie Moses, Les Robinson, Richie Barker, Ryan Williams, Wayne Corden, Ashley Kitchen, Ian Bowling, Tom Curtis, Danny Bacon, Jon D’Laryea, Gavin Saxby, Tom Naylor, Jamie Walker. ONCE UPON A SMILE TEAM: Ray Francis, Greg Lake, Luke Roskell, Shane Ritchie Jnr, Neil Clough, Dan Jillings, Adam Long, Nico Mirallegro, Jay Kontzle, Jack McMullen, Cell Spellman, Reece Douglas, Marvyn Williams, Neil Wainwright, Anthony Quinlan, Thomas Turgoose, Joe Gill, Ayden Callhan, Dwain Boachie, Charlie Quirke, Jake Quickenden, Dean Smith, Ben Ryan Davies. NON-PLAYING STAGS LEGENDS PRESENT: Kevin Randall, Phil Walker, Mick Laverick, Paul Matthews, Ray Clarke, Colin Foster, Rod Arnold, Russ Allen, Jim McCaffrey, Sandy Pate, Ian Wood, Terry Austin.